Are ooey gooey cakes a thing where you live? We are just a couple hours outside of St. Louis and if St. Louis is known for anything (outside of baseball and the arch of course) it is ooey gooey cake. For the un-ooeyed of you out there, ooey gooey butter cake is part buttery, cakey crust and part ooey gooey cheesecakey topping. You usually dust it in powdered sugar and go to town. It's just how it's done. I'd be perfectly happy with this instead of pumpkin pie on Thanksgiving to tell you the truth. Of course that would be semi-blasphemous so maybe we'll just have both instead! 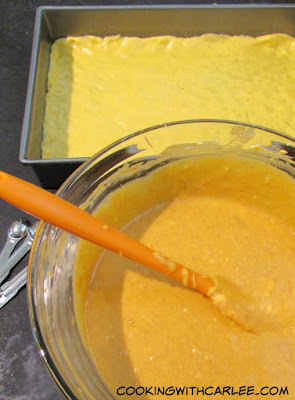 Mix together the cake mix, egg and melted butter. Press into the bottom of the prepared pan. I like to press mine up the edges just a bit to form a crust all the way around. Cream together the butter and cream cheese until smooth. Add the pumpkin, eggs and vanilla, mixing until incorporated. Don't over mix as you don't want to aerate the mixture too much. Stir in the powdered sugar and spices then pour into the prepared crust. Cool completely and then refrigerate until ready to serve. Dust with additional powdered sugar or top with whipped cream and serve! 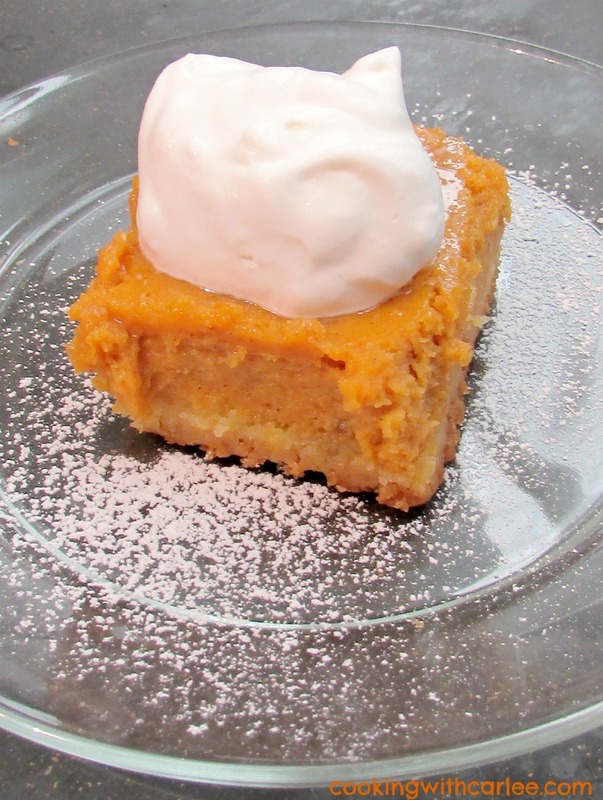 Did someone say ooey gooey and pumpkin in the same sentence? You know I'M IN!!!!! Looks ooey gooey and scrumptious. I need these! Sounds like I would be a fan of ooey gooey cake! It is soooooooo good! 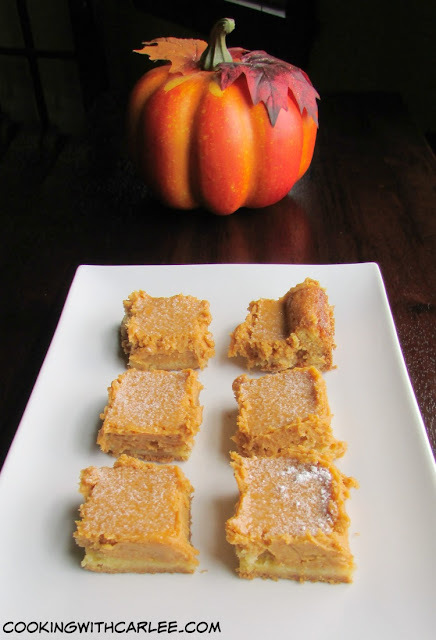 The original version is amazing, but this pumpkin version is a fun way to change it up for fall. I have never tried an Ooey Gooey cake, and I hate to admit that I've never heard of it either! Where have I been? What really excites me? 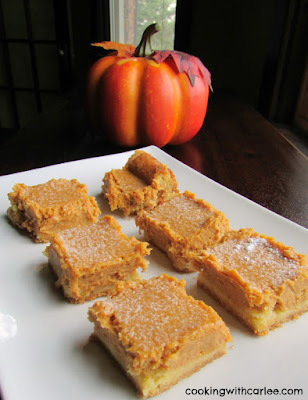 I can use a GF cake mix and whip one up to try! Yeah. This looks so delish! Thanks for sharing, this is right up my alley! I would have thought you'd know about ooey gooey butter cake for sure! I know you are a whole state over, but I thought maybe they traveled that far ;-) You definitely need to give one a try! Thanks, Nikki! What a delicious fall treat! Sounds, and looks, amazing.